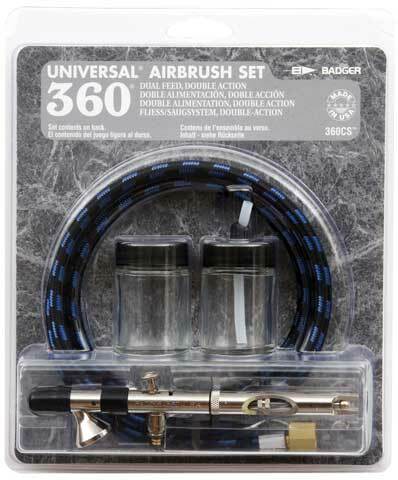 This set features a versatile airbrush that is like two airbrushes in one. The 360º front-end rotation to allows for either gravity- or bottom-feed usage. It can spray pencil thin lines up to a 3"(76mm) spray pattern. The single-size nozzle/needle is designed for spraying a variety of materials, from acrylics to watercolors, inks to lacquers and more. It has a correct weight apportionment balance system and an ultra-comfort, ergonomic trigger cushion. The set also includes two empty bottles and an air hose.